Switching from Blogger to WordPress. And other Changes. I have all my blogs (including this one) hosted on blogger.com but have always felt constricted by bloggers limitations and lack of extras. I have decided to make the switch from blogger to wordpress and a friend over at blog catalog has been gracious enough to create a post over at his blog, detailing the how-to step by step. The article is great for beginners and non-techies, like me. You are the man, Chang! I also plan to install a custom or third party theme, something with a greenish background and more white space than i have now. The cool thing about Word Press, is the plug-ins available which will add additional functionality to my blog. I am excited about the move and the many more changes i have in store for Veggie-Blog. My aim is to make this blog a go-to blog for vegetarians looking for information, entertainment, and product news within the vegetarian lifestyle. Thanxs for reading, commenting, and being my friend. UPDATE: I have created my new vegetarian blog, Groovy Vegetarian, it has a shiny brand new name and look. It is empty, but soon it will have great content and it will launch officially, on or around July 4th. Please visit, and let me know what you think. Thx, Missy. 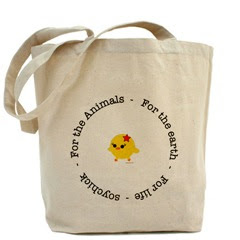 Take a look at these cute canvas shopping bags designed by Soychick, a vegan from California. Soychick has a variety of items in-scripted with a chick in all sorts of poses and with “lots of attitude”. She has tops, bottoms, caps, aprons, tees, tanks, and the canvas bag in the picture, is perfect for grocery shopping. One of the best ways to reduce our dependence on plastic bags, is to buy and use canvas (or similar cloth) bags, and to take these with us on our shopping trips. I would say the SoyChick Canvas Bag is a healthy, and oh! so cute alternative to plastic. To learn more about green living, visit eco-blog, Keetsa. Watch as Mr. Lee meets a snake, has a rendezvous with a female kitty, lounges about under cars, and meets new and interesting friends in his daily journeys. Too cute! This guy from Germany has attached a cat cam to his pet cat, Mr. Lee, and the travels are caught on tape. I love the meanderings through the backyard, i think i should attach a cam to one of my three four-legged pussies to see what kind of messes they get into. The so called “wild hog”, wasn’t wild at all, it was a family pet, owned by an older couple in Alabama, reports Fox News. The large hog escaped four days prior to being killed, by an 11 year old, after being hunted for three hours. The pig named Fred and considered a “gentle giant” by its owners Phil and Rhonda Blissitt, was a 2004 Christmas present to Rhonda from Phil since the pig was 6 weeks old. I don’t know what makes me sadder, the fact that Fred was hunted for three hours and shot to death by 16 rounds, or the fact that it came at the hands of an 11 year old shooter. Fred weighed an astonishing 1,051 pounds and is probably gonna go down in the books as one of the largest hogs ever discovered. The pig was so large, that rumors swirled around the internet that the photos were fake, but pet owner Rhonda confirmed its natural size. The shooters father claims that the pig was feral and they did not break any rules. I’m pretty sure Fred disagrees with that sentiment. Peta (which i’m not terribly fond of by the way) is having their annual “Sexiest Vegetarian Alive ’07” contest, and the nominees are hot, hot, and hot. There are Americans and Europeans listed, the young and old, the accomplished, the rugged, and the oh sooooo sweet looking. Pictured are some of the nominees. Pictured above are Jared Leto, Natalie Portman, and (spidey man himself) Tobey McGuire. Vote for your fave, by visiting here, and choosing among the male and female nominees. Hope your celeb makes it, then go vote! You are currently browsing the Veggie Blog blog archives for June, 2007.